Saturday 23rd August, The Spire, Dublin, starting at 2pm and Marching from the Spire to the Dáil. 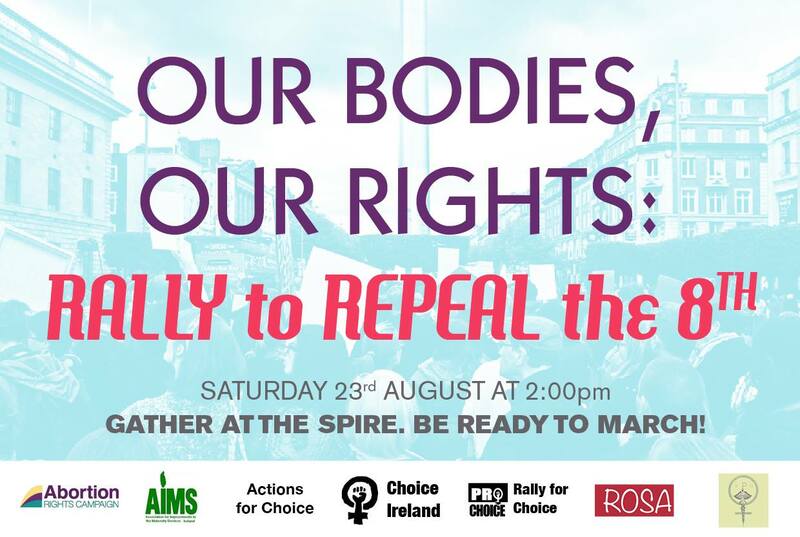 Organised jointly by Choice Ireland, Abortion Rights Campaign, Rally For Choice Ireland, ROSA – for Reproductive rights, against Oppression, Sexism and Austerity, Real-Productive Health , Aims Ireland and Actions for Choice please join our protest Saturday 23rd Aug at the Spire Dublin at 2pm and be ready to March. This is legislation we cannot live with and we are calling for the repeal of the 8th amendment to the Constitution in order to allow free, safe, and legal abortion on request.